We provide dedicated methods for sending images, and for sending rich content messages (which we call 'cards') and videos. Provide a publicly accessible image URL, and we'll display it in a format optimised for the platform (messaging app) that your user is on. You can also use an image from your local machine by browsing to the file or by dragging and dropping the image. For example, Messenger provides a dedicated method to send an image, which we utilise. Whereas Telegram only accepts an image in the form of a text message containing the image URL, which Telegram then takes care of 'unfurling' (displaying as an actual image rather than the link). You can always be sure that if you use this method, your image will be displayed in as nice a format as possible. 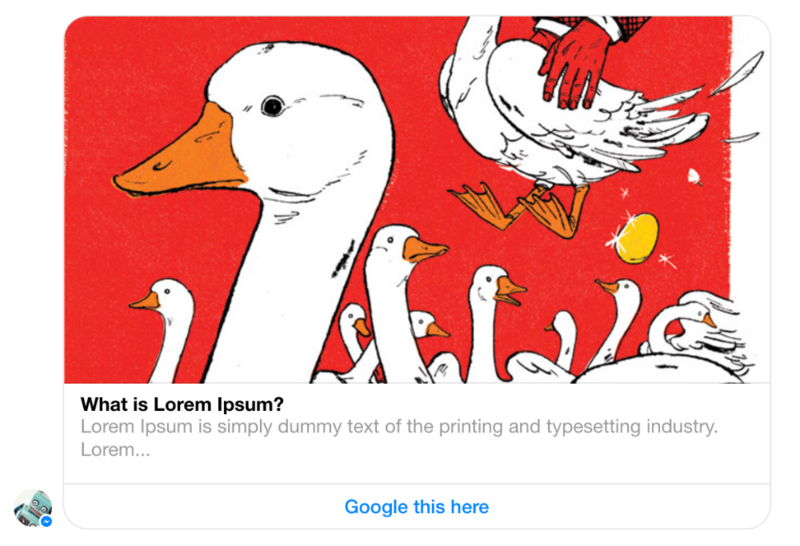 A card is a snippet/preview/summary of content, that usually includes some text, a link and an image. You might want to use a card for displaying a summary of a news story, or for displaying the details of a product. As with Send an Image, the card will always be sent in a format optimized for the messaging app being used. 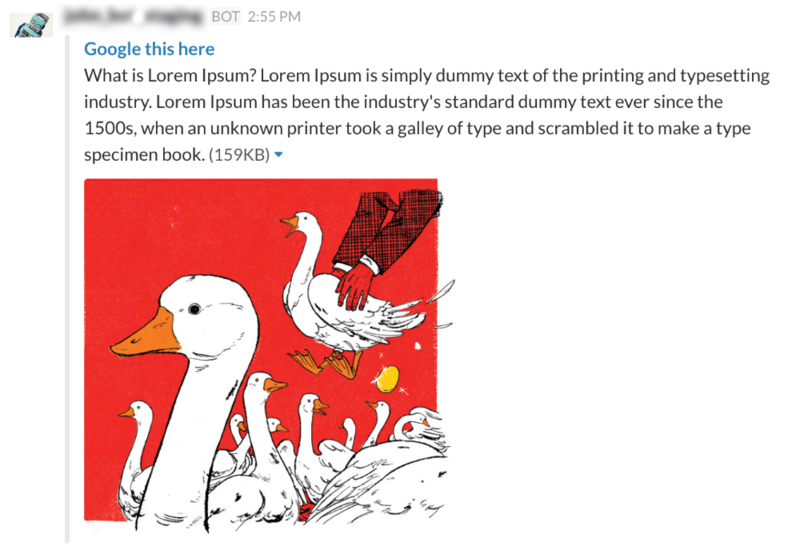 Some platforms provide native functions for sending this type of message, whereas on other platforms your card will be sent as a more primitive combination of text, a link and an image. We'll take care of falling back to the best method for the platform your user is on. Title - a headline for the content (i.e. a news headline or a product name). For best cross-platform support, keep to under 80 characters. This is the only strictly required field, although a card with only a title is pretty useless! Text - a short summary of the content (i.e. an excerpt of a news story or a product description). For best cross-platform support, keep to under 80 characters. Image URL - a publicly accessible image URL. Link Text - a call-to-action for the link. Keep to under 20 characters for best cross-platform support. Link URL - a publicly accessible link for the user to find out more about the content. Shortcuts - add shortcuts to prompt the user. These are displayed as buttons in most platforms. When the user clicks a shortcut button, the word/phrase is triggered, just as if they'd typed it in. This action allows you to send up to 10 cards as a set. 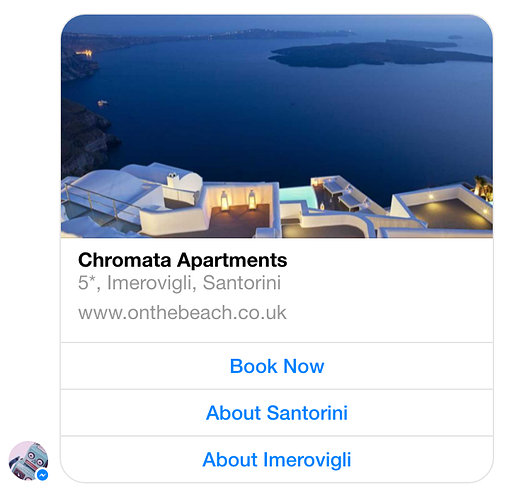 This works on all platforms, but is most useful on Messenger, where the cards are displayed as a horizontally scrolling 'carousel'. On other platforms, separate cards are sent, just as if you'd used separate Send a Card actions. You can also add shortcuts to card sets. Provide a publicly accessible YouTube, Vimeo or Wistia video URL, and we'll display it in a format optimised for the platform (messaging app) that your user is on, just like with an image.